It’s tough to make a show about writers. We’re generally dull people, but besides that, externalizing an internal process…that’s fraught with issues, meaning lots of cheesy voice-overs of bad writing. There’s a disproportionate number of movies about writers, because writers know about writing and think what they do is really important, when it really pales in comparison to, oh, neurosurgery. 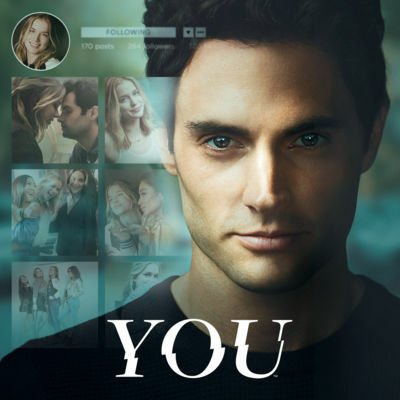 Which brings us to You, a Netflix Series that’s got the glossiness of Melrose Place, and its brain too, depending on your perspective. Guinevere Beck (“Beck”) is an MFA student with aspirations of holding down a John Updike New Yorker gig, or maybe becoming the next Robert Pinsky. Problem is, she’s neither inquisitive nor creative, procrastinating like it’s everybody’s business and with a work-rate to rival JD Salinger. Speaking of whom…one of Beck’s friends is a distant relation to Mr. Catcher in the Rye. 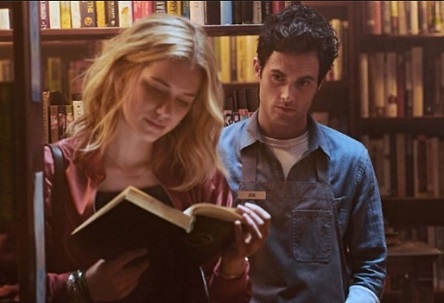 Beck crosses paths with dashing Joe (pictured), a literate Midtown Manhattan book store manager who can match her with verse and is no slouch in the flirt department. Soon, they hit it off, but paranoid Joe stalks her immediately, gazing into her palatial brownstone walk-up (seriously, if this is what passes for student-subsidized housing in New York City, I can reasonably expect to rent a 1,000 square-foot dorm). This then escalates into social media stalking, admittedly not too difficult as both Beck and her cadre of friends are so self-absorbed they could double as infomercial sponges. What Joe sees in her is anybody’s guess, and where You keeps you guessing is that it’s not the usual “if I can’t have her, no one can” boilerplate. Instead, Joe is more than happy to play the long-game to wait out a revolving door of sub-par lovers before he can tee off. There are some fun subplots where our charming stalker stepdads a neighborhood boy on his stoop, and there are enough references to good writers to let the occasional sloppy writing pass. Pure, sugary junk, this Netflix show is oddly enjoyable even if its writers have already painted themselves into a narrative cul-de-sac in the first season (no spoilers here). This entry was posted in Black comedy and tagged horror podcast by Really Awful Movies. Bookmark the permalink.